Get out of town! Were in the world did they a store that still sells those wicked, sweet scoots? That amazes me. Megan you are fantastic. Thank you so much for the supper sweet blog headers, they are awesome!!! 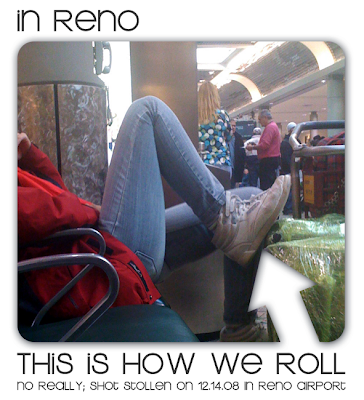 Sadly, I grew up in a town very similar to Reno and their fashion style. I know those shoes and those tapered jeans all too well. Although, tapered jeans are back in, not ones with pleats on them...and you know this person has the latter jeans...Ahhh, Reno! PS- You really ARE obsessed with you iphone!